When determining executive performance, traditional models of CEO compensation consider relatively short time frames. This increases the likelihood that CEOs make strategic organizational decisions at odds with the long-term value of shareholder equity and the overall financial health of a corporation. We propose a compensation structure based on a system that escrows compensation for a set period of years stretching into the executive's retirement. The longer time frame is designed to prevent the executive from taking short-term actions that may enrich the manager at the expense of the firm's future profits. The plan also provides a rebalancing mechanism to maintain a constant percentage of compensation in cash and stock, so that the executive always has sufficient equity in the firm to provide performance incentives -- even if the stock price falls. Linking compensation to share price has been viewed as a way to make sure the interests of the CEO and other top managers are aligned with those of shareholders. In recent years, however, the system has encouraged executives to take actions that boost share price in the short term but hurt shareholders and other stakeholders later, after the executive has cashed out. Most compensation systems fail to adapt to changing conditions in the firm and its share price. If the firm is in trouble and the share price falls, stock options are worth little. Consequently, the executive loses an important incentive to perform just at the time when it is most important to be working at full throttle. So, to keep managers working hard at troubled times, boards typically give the executives more shares for free or they re-price existing options. That's highly controversial because, in effect, the CEO is being rewarded for failure. Existing compensation schemes typically have short vesting periods that allow executives to reap the rewards of their actions before their full effect may be realized. For instance, Angelo Mozilo, the former CEO of Countrywide Financial, made $129 million from stock sales in the 12 months prior to the start of the subprime crisis, which sent Countrywide shares tumbling and led to the firm's acquisition by Bank of America. Other executives have manipulated corporate accounting to boost the share price, then sold their stocks at the peak, as did Enron executives through the creation of shell subsidiaries in which they hid losses. In addition, executives could take other actions, such as cutting investment in research and development which would lead to short-term earnings spikes and an increase in share price, but cripple the firm in the future. Even a compensation plan that's well-designed at the outset can fail to keep pace with the market and the company's fortunes. Take the case of a corporation that pays its boss in stock options. If the company hits a rough patch and its shares plummet, an executive's stock options become close to worthless and lose much of their incentive effect. This problem may still exist even if the executive has all stock and no options. Let's say the CEO is paid $4 million in deferred cash and $6 million in restricted stock. At the outset, boosting the value of the company by, say, 1% is worth $60,000 to him—a good inducement to put in more effort or drop a costly pet project. But if the share price halves, his restricted stock is now $3 million. So, this incentive is slashed to $30,000. To maintain the power of the incentives, the CEO must be required to hold more stock after a stock-price decline. How much more? In the paper with Profs. Xaviier Gabaix, Tomasz Sadzik and Yuliy Sannikov, we show that the CEO's stock should remain a roughly constant percentage of compensation. In the example above, this target was 60%. At the start of the CEO's contract, that meant $6 million out of $10 million total compensation. We call this the CEO's "incentive account." Now that the stock has halved, the incentive account is worth only $7 million—$4 million in cash and $3 million in stock. 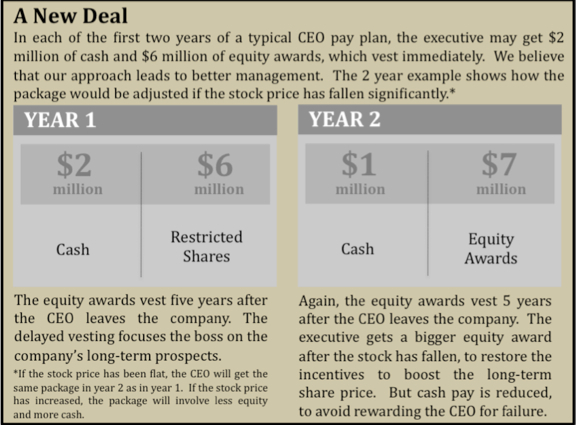 To keep the equity level at 60%, the CEO must have $4.2 million of stock. This is achieved by rebalancing the CEO's incentive account: exchanging $1.2 million of cash for stock, so that the executive now has $2.8 million of deferred cash. Another critical change companies should implement is to lengthen the time that executives must wait before they can cash in their shares and options. All too often, stock and options have short vesting periods, sometimes as little as two to three years. This encourages managers to pump up the short-term stock price at the expense of long-run value, since they can sell their holdings before a decline occurs. A CEO can, for instance, write subprime loans to boost short-term revenue and leave before the loans become delinquent, or scrap investment in R&D. This is possible since, in many cases, stock and options immediately vest when the CEO leaves the company. The proposed Dynamic Incentive Account would have a longer-term time horizon, and vests gradually even after the executive's retirement. Since the proceeds from stock sales must remain within the account, this deters the executive from manipulating the share price upwards to trigger a sale and immediately withdrawing the proceeds. Instead, if the stock price subsequently falls, the cash proceeds are converted back to stock. The length of the vesting period depends on the kind of company. For instance, the waiting period should be longer in businesses where the CEO can take actions with very long-term consequences. It might be seven years or more at a drug company with a lengthy product pipeline. For a banking executive overseeing a portfolio of credit default swaps with 7 year expiration dates, the full vesting ought to be completed slightly after the last of these contracts expire. But the wait might be shorter at, say, a commodity chemical company, where CEO decisions usually don't have an impact more than a few years ahead. Of course, there is a trade-off. If companies make CEOs wait too long to collect, the former bosses might be exposed to risks outside their control, such as regulatory changes that eat into profits. Companies need to find a balance that works best for their situation. One big attraction of this hack is that it is very easy to implement. It uses the basic building blocks of executive compensation that are currently widely employed – cash and equity. The implementation only requires extending the vesting period of the executive’s equity, and making the mix of cash and equity in a given year depend on the firm’s performance in the prior year. A related attraction is that the Dynamic Incentive Account is easy to value. The board knows how much it is paying the CEO, since both stock and cash are simple to price. This clarity contrasts with compensation proposals that involve more complex instruments (e.g. indexed options with performance-vesting provisions) which are more difficult to value, so the board does not know how much it is paying the CEO. However, we recognize that a potential challenge to implementation is the idea’s novelty – innovations typically lead to resistance. There are two solutions to this issue. First, the DIA can be initially applied only to part of the CEO’s compensation. For example, the DIA could be used for 25% of the CEO’s compensation, whereas the remaining 75% can be paid in traditional ways. This “gradual” implementation can allow the board to test both the pros and cons of the DIA in a non-committal way. If the DIA indeed leads to superior managerial decisions, the board can then increase the percentage of compensation that is comprised of the DIA over time. Second, there exists a simple way to implement the DIA’s principles that does not involve creating an escrowed account. One potential issue with the “literal” implementation of the DIA (creating an escrowed account and rebalancing the CEO’s stock according to firm performance) is that the board may be reluctant to amend the terms of previously awarded compensation by exchanging stock for cash. Therefore, an alternative implementation would be not to set up an escrowed account, but continue to pay the CEO with the traditional building blocks of cash and restricted stock each year. The desired rebalancing can still be easily implemented without altering the CEO’s previously granted stock – if the stock price falls in a given year, next year the CEO is simply paid more restricted stock and less cash. An example is presented below. Boards can also explain the attractions of the DIA to CEOs to obtain their buy-in. Since options can expire worthless, they are riskier than stock, so the DIA exposes the CEO to less risk than traditional packages that involve options. In addition, the CEO gets an additional reward from good performance compared to standard packages – not only does the value of his stock go up, but he is allowed to sell some of his stock to reduce his risk. In contrast, with traditional restricted stock, the vesting period of the stock is not accelerated by good performance. Of course before determining the executive performance compensation they must check the financial health of their corporation. Financial health is very important because it plays a big part in a company, it will decide the future of it. On the other hand accounting will play a big role in this one, they will be the one that will provide the financial status and it needs to be consolidated with the right manner. While we are handling any organizations then we should be more thoughtful about the executives so that there is no need of hacking executive compensations with dynamic incentive accounts. More ever we need to develop holistic performance measures, stretch management frames and perspectives. This will develop the attitude of the different organizations and improve the different executives and their salaries also. I would completely agree with the practical impacts of the above hacking executive compensations. Thanks to Dr.Philip for the way the subject EXCENOMICS is submitted to the audience. The sentence that he pointed out to the gathering, in earlier days the instance of an individual is decided in the order of first knowledge, second skills, third Attitude is now as the Attitude first, Skills second and Knowldge third in the acronym "ASK" has stricken everybody’s mind giving a clear focus of the topic. The terminology Exonomics sounds an excelient phrase. It emphasises excellence in our endeavours. Thanks to Dr.Pradeep Philip for his knowledge share in this topic. This fails to recognize that the basis of non-cash executive compensation typically rests on a totally out-dated and erroneous concept – that the stock price reflects shareholder value, and that stock price reflects a measure of performance in any meaningful way. Stock price is in fact one of the worst ways to measure and reward executive performance. •	Stock prices are based on emotion, not on rationality. When the market rises or falls by nearly 50% over a year period, stock price does not reflect the performance of each individual company. There is no “rational” or “right” PE ratio, and bubbles and crashes distort individual company impact. •	There are no long-term stockholders any more. The days of owning AT&T stock for 30 years for retirement are gone with typewriters. Stock changes hands in months, weeks, days, hours and even seconds with algorithm trading, creating extensive “ownership” churn. Price is short-term trading oriented. The only long-term owners are the executives who are rewarded with stock. •	Stock price is subject to manipulation. Consider this: if your CEO is not smart enough to lower the stock price before his/her options prices are set, and to raise stock prices just before he/she qualifies to cash it out, is he/she really smart enough to be your CEO? The recognition that the CEO in a large organization is only 1 of 1000, 10,000 or sometimes 100,000 staff that are all pulling in their weight and working in harmony to create value for the organization. Rewarding CEOs/C-suite only for true accomplishment i.e. true growth in ideas/new products, in customers, in territories instead of crediting them with bonuses for creating what I call 'revenue growth mirages' through efficiency tricks - such as reducing wage bills through pay-cuts, outsourcing, automation. Running an organization optimally should be par for the course and not worthy of humongous bonuses - instead, allowing the CEO to pocket bonuses based on a percentage of wages saved due to downsizing, outsourcing, and similar practices encourages CEO's/C-suite to devote all their psychic energy to predatory practices on their own labor force rather than on true instrinsic growth of the company. Over the years the MBA industry has managed to convince themselves of the fairness of shaving off a dollar or 2 off every employee's wage (or shaving off an employee or 2 using automation developed by those very same poor suckers!!!) and crediting such "accomplishments" to the CEOs/C-suite, who claim a share of those savings. the now overpriced organization overprices its products, and the, most often oligoplistic, industry too blindly overprices to keep up perversely with the "competition "
the analysts covering the industry drink the same kool-aid! This is the economy we're in today! In UK and Europe they say American execs routinely ask for and get outrageous compensation and perks for the same role and responsibility in the same location as their UK/European counterparts. So the whole "entitlement" mind-set that these super geniuses in the C-suite feel about themselves needs a 180-degree correction. Right now we are in Garrison Keillor land - where "all the children are above average". Not wanting to shoot down a Wharton MBA prof's idea or anything - (I too am a product of that school!) - but the idea that the $6 million or 10 million in stocks needs to be linked to long or longer term performance must come only after a core, accurate, fair, holistic calculation is made that the scale starts at 6 million and not 600K! This is creative and very interesting. There is hope to nab ceos' unrealistic pay. Many people and economies have been torn to shreds by executive rascality. As simple as DIA reads to implement, one knows the involved parties will be a stumbling block. But since the idea is out, it is a matter of time before it starts rolling to corporate standard. Infact, this lights up a bulb in one's head that we should start thinking of extending same beyond executive directors to government & political office holders especially in developing economies where accountability is near zero. With DIA, succession will be handled with the objectivity it deserves and meritocracy will make its journey out of extinction (even if gradual).